The Bowflex Revolution Home Gym is a home workout system that allows the user to do a variety of strength training exercises. This product has independently moving arms allowing for 10 different positions and up to 170 degree adjustment, and it features 220 pounds of resistance for upper body workouts. This home gym also allows for up to 600 pounds of resistance for lower body workouts, as well as leg extensions, a vertical bench press, and a preacher curl attachment for additional exercises. 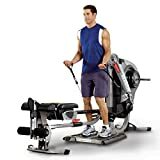 The Bowflex Revolution Home Gym is currently priced on Amazon.com at $2,499. The ability to do over 100 workouts with this home gym systems is one of its strengths. There are several different exercises that can be done for both the upper and lower body, and the amount of resistance that is offered for upper body workouts (220 pounds, or 300 pounds with an upgrade) surpasses other home gyms. This system is also extremely easy to use. Weights can be added with just one movement, and the amount of resistance can also be changed to ensure that even a novice weight lifter can use this machine. This machine also has a very good feel and fluid motions that reduce the stress on muscles that can be felt when using free weights or other home gym systems. This means that the user can work out longer and harder without having to worry about feeling extremely sore the next day. The Bowflex Revolution also allows users to work out at home on their own time. When people work long hours, it can be hard to get to the gym. This system allows users to cut out their commute time to the gym and spend more time working out. This system is also great for users who do not have anyone to go to the gym with as well. This system is also much more compact than some other home gym systems, meaning it will fit in nearly any room. It is also very sturdy and able to withstand the rigor that comes with working out. There have been many complaints about the weight increments that are available on this home gym. The smallest increment on the gym is 5 pounds on each side, or 10 pounds total. There are many home gyms that offer smaller increments to better mirror the use of free weights. There have also been some cautionary tales to first time users that this system may be difficult to get used to. The free-weight functionality of the system does not move in a linear fashion, much like someone would experience when working out with actual free weights, but in more of a curved motion. Some users have complained that it is difficult to get accustomed to this. These units are also extremely heavy, which is mostly due to their sturdy construction. Many users have warned others to put the system where you want it and leave it there, since it is very difficult to move afterward. There have also been issues with certain parts breaking off the machine. While the user is able to break the machine down for storage, some of the units have fallen apart while in use. There have also been complaints of seats falling when they are supposed to stay in an inclined position. Similar issues were experienced on other Bowflex models, which led to recalls in 2004, 2007, and 2009. 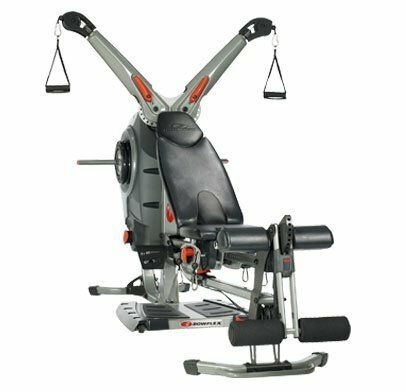 Overall, the Bowflex Revolution Home Gym is a sturdy piece of equipment that is versatile and easy to use. Even though the price tag can be very high, this product offers value for the user for many years. Once the user gets used to the differences between the home gym and free weights, it is clear that the home gym offers so much more.